THE STORY OF THE MOST FAMOUS INTERNATIONAL BOOK WAR -- NOW IN PAPERBACK! Intrigue! Perfect binding! Warehouse Fires! Price Cutting! 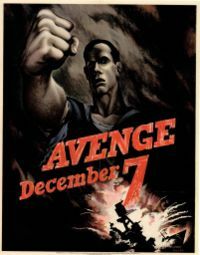 Mr. Chairman, honorable vice presidents, members of the board: yesterday, December 7th, 1941 - a date which will live in infamy - the United House Publishing Company's distribution network was suddenly and deliberately attacked by forces of the Japanese firm of Tojo Books. United House was at peace with that concern, and, at the solicitation of Chairman Tojo himself, was still in conversation with its board of directors and its Chief Operating Officer looking toward the maintenance of equitable profit in the Pacific readers' marketplace. Indeed, one hour after Tojo labor representatives had concluded an aggressive agreement stealing away our most trusted and competitive trucking service and thereby crippling our distribution network, the Tojo Books representative to United House and his colleague delivered to our Secretary a formal reply to a recent United message. And while this reply stated that it seemed useless to continue the existing negotiations, it contained no threat or hint of price war or of attack. It will be recorded that the distance of Hawaii from Japan makes it obvious that the attack was deliberately planned many days or even weeks ago. During the intervening time the Tojo Books board of directors has deliberately sought to deceive United House by false statements and expressions of hope for continued marketplace cooperation. The attack yesterday on the trucking and printing contracts has caused severe damage to United House's operations. I regret to tell you that very many United jobs have been lost. In addition United House shipments have been reported lost on the high seas between San Francisco and Honolulu. Yesterday the Tojo board also launched an attack against Merrick Paperbacks Edition, our largest ally. Last night Tojo agents set fire to Berrin's Warehousing facilities. Last night the Tojo Books board approved a motion to enter the Science Fiction market. Last night Tojo lawyers launched suit against our underwriter, Oppenheimer Insurance. Last night the Tojo Books board liquidated its substantial share of Werner Paper Corporation, resulting in the bankruptcy of that necessary firm. And this morning the Tojo Books bought over 50% ownership of Ink, Inc.
Tojo Books has, therefore, undertaken a surprise offensive crippling or destroying nearly all of our necessary and trusted suppliers and distribution network. The facts of yesterday and today speak for themselves. The people of United House have already formed their opinions and well understand the implications to the very life and safety of our corporation. As president and chief executive officer, I have directed that all measures be taken for our defense. But always will this mighty undertaking, the United House Publishing Company, remember the character of the onslaught against us. No matter how long it may take us to overcome this premeditated invasion, the United House employees in their righteous might will win through to absolute victory. I believe that I interpret the will of the board of directors and of the shareholders when I assert that we will not only defend ourselves to the uttermost but will make it very certain that this form of treachery shall never again endanger us. Hostilities exist. There is no blinking at the fact that our shareholders, our distribution territory and our interests are in grave danger. With confidence in our executive ability, asset mix and healthy bank balance - with the unbounded determination of our employees - we will gain the inevitable triumph - so help us God. 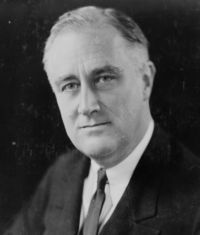 I ask that the board declare that since the unprovoked and dastardly attack by Tojo on Sunday, December 7th, 1941, a state of corporate war has existed between United House and the Japanese Empire of Tojo Books. United House propaganda poster, featuring loss of book shipments at sea due to Tojo Books' surprise attack. United's president Roosevelt, straining to get up. United's president & CEO Roosevelt seated himself to thunderous applause. Vice president (Supply Chain) King looked at vice president (Business Development) MacArthur. How had it come to this? The Founder, startled at his desk. Tojo, known only by this singular personal pronoun, was the second son of an inferior grade paper lantern maker and an heiress of a slowly dwindling estate of mostly unarable land bordering the quaint pre-war town of Nagasaki. As he was not the first child, his parents did not bother to give him a distinguishing name, preferring to refer to him as "offspring", or "You, boy, get back here to labor at the lantern-making table." Soon interested in all things American, Tojo fled an upbringing of whippings, glue and accidental midnight workbench fires to move towards this attraction to things that actually functioned. Until his sixteenth year Tojo survived by his wits in port warehouses, eating harbor fish and stolen rice. Occasionally he did a few hours' travail loading or unloading vessels, and at every opportunity examined American goods to determine why they were so much better than anything his native land had yet produced. As the economic boom of the 1920s brought more and more American products before Tojo's absorbing eye, the young man began to steal samples of these items and take them apart in investigation. Eventually he concluded there was one item he could miniaturize and copy while putting a Japanese stamp firmly upon the idea; thus, the Origami Air Force was born. Employing his knowledge of paper together with modern duplication methods, Tojo was able to market a limited line of biplane battlecraft from the Great War to locals. 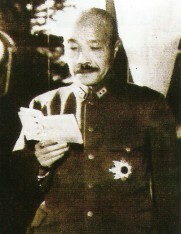 As the idea grew in popularity, however, Tojo soon found himself forced out of the marketplace by businessmen with actual factories and while their products were of poorer quality to his own, the fact was that Tojo was in his late teens, living in a series of warehouse hellholes from which he had to move constantly, and folding only at night. The Origami Air Force netted the young man a few thousand yen profit and he awaited his next chance to achieve what he now knew was the goal of a world-straddling empire, fame, fortune, and the possibility of earning a proper first name. The Great Depression, together with DuPont's introduction of new plastic materials, offered Tojo what he thought was an opportunity to take advantage of the material frugalness necessary at the time: he partnered with a local factory and produced a set of knockoff coin rollers for saving consumers. Unfortunately due to shoddy measurements and poor market research, the rollers were all manufactured approximately 1/16" too small in diameter and were therefore useless. Tojo was returned to poverty. But his eyes were bright and slanted, and he was ready for the fight. He was also hungry, which lead him to his next marketplace offering: the bansai meatball tree. The original, an image 'borrowed' by a competitor from another time. With the stylish invasion of Abbysinia, all things Italian were suddenly popular. I Love The Dictator armbands were all the rage and ruffino wine bottles appeared in the streets. Conferring with a bioengineering colleague, Tojo again combined the traditional with the newly desired, and snaring some angel investors was able to set up a greenhouse to experiment within. Alas, the grafting of hamburger to wood, together with the devastatingly slow life cycle of the banzai tree, proved fatal to the venture. Tojo's enthusiasm and daring impressed the investors as necessary in the new world economy, though, and they would not forget him. He continued to study deeply of American manufacturing and quality management methods. A final off-target adventure into the silkscreen life following the resurgence of Lovecraftian horror produced a minor profit through "You Run Like Zombie" and "Emperor Is My Elder God" t-shirts. "Ahh-so," Tojo was famously misquoted and forgotten as the source of in referral to his opinion of the man who had made the original translations, and therefore entered an uncredited Asian phrase into popular American culture. Now a Six Sigma Blackbelt, Tojo had made and lost two minor fortunes, discovered the greatness and limitations of biotechnology, and established himself as the most unorthodox ideas promoter in the Japanese business community. He was twenty-one. Percieving an open market segment in children's books, Tojo gathered his resources and launched a printing firm. At the time, he was forced to subcontract printing and distribution, having funds sufficient only for purchasing rights to authors' works. However, the 1936 acquisition of Ellie and the Magic Cherry Tree and its subsequent sale to MGM for 10% of the feature film's profits proved a masterstroke. Tojo walked away from the deal a millionaire, and in 1939 bought his first print shop. Unruh: You've had many entrepreneurial ideas. How did you pick up on children's books? Tojo: Literacy is prime indicator of national ability. I see American children are literate. Many American children. Literate American children need literature. But Bushido tradition teaches important fact:  in war, get to battlefield first. The Founder fools the reading public into believing in his magnificent myopia. Don't be fooled: the pages of that poetry book have extra-large print. Unruh: So you beat the competition to the punch. Unruh: How exactly did you do that? Tojo: Are you American spy? I will not give you trade secrets! Leave my presence at once, gaijin dog! United House fights back against both soft-headed labor initiatives and happy Tojo Books rank-and-file in this direct message to the consumer. This was only the beginning of Tojo's problems with the American press. After contracting a premature-aging disease in the process of being splashed by a compound during a quack demonstration of a supposedly new printing process, the Founder lost all of his scalp hair and 68% of his eyebrows. He now bore the odd, mature appearance of a man more than two decades his senior. 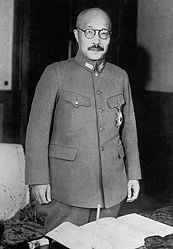 This, together with what Westerners perceived as unfamiliar mannerisms and sinister formalities, leaned the press to portraying Tojo as a grasping, voracious menace to young American minds. He fought back with innovative retail ideas, conjoining tea houses with book sales and spreading what United House president Roosevelt called in startled tones "a great rash of infiltrative custom" from state to state. While the faint hope of marketplace division flickered at their initial encounter, as the two years passed to December 7, 1941 it became clear to both sides that Tojo Books and United House were on a collision course. Rampant like elephants during must, the two firms sent agents to gibber and fling dung at the other like baboons. The public became confused. Were they supposed to drink tea, or was that UnAmerican? Posters seemed to insinuate it was somehow now wrong to smile. Back in Japan, Tojo's directors paid him a visitation. They had had enough, they told him. United House had to be stopped. After much solitude, whiskey-drinking, and ritual bathing, Tojo agreed. Tojo's agents spread instruction and news of the attack via code yodeling. "...and that's when I reached for the life vest." "One should always try to keep one's knees to one's chest when in an impending state of hypothermia." With satisfaction, the president set down the pen and considered breakfast. At this moment an aide fell into the room with terrible news. The kitchen was out of chocolate sprinkles and the stores were closed! Another aide pushed past with the more terrible news that Tojo Books had launched a sneak attack and destroyed United's Pearl Harbor warehousing and distribution centre. A passing fugue ensured that no reaction occurred for several minutes. Roosevelt sat in bed and daydreamed about chocolate. Then he did what every chief executive since then has done in an emergency--called the IT Department. 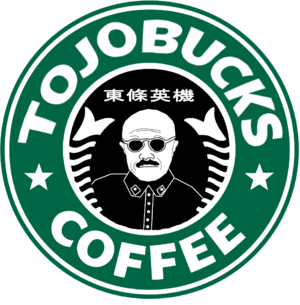 On the other side of the world, seated in the modernistic splendor of his office in central Tokyo, Tojo idly toyed with the spoon in his tea cup and laughed quietly to himself.